We are super excited to announce today's very lucky Razzberry Fizz giveaway winner. 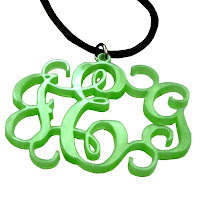 One lucky lady is winning one of Razzberry Fizz's super cute monogrammed necklace in a font and color of their choice. After compiling all of your entries today, we have randomly drawn a winner. Hooray Brandi! Please email us at clemsongirlblog@gmail.com to claim your fabulous prize! You have 48 hours to contact us or we will draw a new winner. We hope you have had the chance to visit Razzberry Fizz on Facebook and take advantage of their new 'Get it Now!' shopping on their Facebook page. Special thanks to Razzberry Fizz for sponsoring today's giveaway! !